Live Right Here Right Now is a live album by heavy metal group Van Halen. It was recorded at Selland Arena in Fresno, California on May 14 and 15, 1992. This gives very little attention to the David Lee Roth period of songs from highly regarded albums like the self-titled debut and 1984. Van Halen are crying out for an archive release. Alan Fitzgerald played additional keyboard off-stage according to Wikipedia. 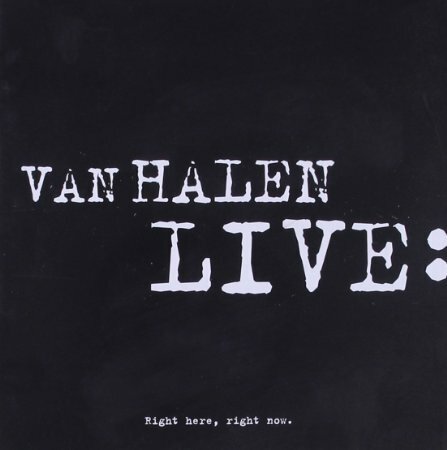 This is the only live album so far released by Van Halen. Do you think this is the best live album featuring Sammy Hagar? I intend to put a poll together when I have featured more of his albums. I don’t think this Van Halen album will get enough votes to deserve to be included in the poll to find the best hard rock and heavy metal live albums. I have included it in the second division of albums and if it gets enough votes, it can be promoted to the main list of if it doesn’t do well, it might even be relegated. This entry was posted in 1990s Live Albums, Heavy Metal Live Albums and tagged 1990s hard rock, 1992 live albums, heavy metal 1992, Sammy Hagar Live Albums by Paul Simister. Bookmark the permalink.